The technique of simultaneously buying a commodity at one price in one market and selling it at a higher price in another market to profit from the spread between the two prices. Although the price difference may be small, arbitrageurs typically trade in huge volumes so they can make sizable profits. Trying to wrap up the sale of his company to a larger one Robert Miller soon finds he’s got more problems than that. This well-written story brings out one of Gere’s best performances (if not his very best) as he tires to sort things out. 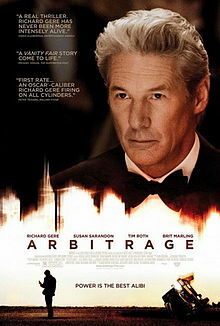 In fact the acting is uniformly good and the pacing excellent. Not wanting to give away anything I will not dwell too much on the plot other than to say that this is one of the few thrillers that does not rely upon car chases to keep our interest. How refreshing. for profanity, sexual content and drugs. Ellen helps Robert with his tie and from one shot to another the knot is up or down from it’s previous position. Robert storms in the office and immediately locks the door but when he goes to leave he opens the door without having to undo the lock. Ellen’s workout t-shirt is off her right shoulder when viewed from the front but back up where it belongs when seen from behind. The toll to cross the Triborough Bridge is posted as $6.50 and Syd hands the toll booth person a bill and only gets back the requested receipt but no change.